Recent observations with the Hubble Space Telescope suggest that the first stars formed as little as 200 million years after the Big Bang. This is much earlier than previously thought. Astronomers have observed large amounts of iron in the ultraluminous light from very distant, ancient quasars. This iron is the "ashes" left from supernova explosions in the very first generation of stars. Stars are nuclear factories that process lighter elements such as hydrogen and helium to successively heavier elements such as nitrogen, carbon, and finally iron. New observations with the NASA/ESA Hubble Space Telescope show massive amounts of iron in very distant and ancient quasars. This pushes the era of the very first stars in the Universe back to as early as 200 million years after the Big Bang (corresponding to a redshift of around 20). This is much earlier than previously thought and is in agreement with recent results from the Wilkinson Microwave Anisotropy Probe. In October 2002, a team led by Wolfram Freudling used Hubble's infrared instrument, NICMOS (Near Infrared Camera and Multi-Object Spectrograph), to observe three of the most distant quasars known (redshifts 5.78-6.28). The light from these three quasars had travelled for 12.8 thousand million years before reaching Hubble's spectrograph. It had left the quasars 900 million years after the Big Bang. The spectra show clear signs of the large amounts of iron. 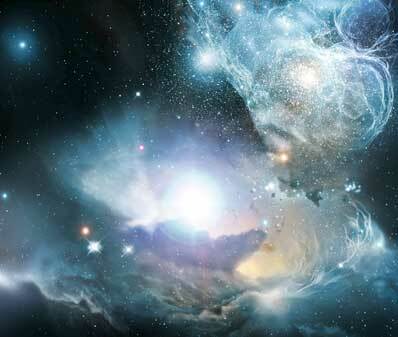 This is the first time that elements created in the first generation of stars are found. Wolfram Freudling comments "Iron is a good indicator of the evolutionary state of a quasar. This element is not created during the Big Bang but in stars later on. These stars have to form, burn their fuel and explode before iron can be detected. This process takes times, up to 500 or 800 million years. This is the reason why we believe that the iron we detected with Hubble was created in the very first generation of stars which formed soon after the Big Bang." Hubble's position above the atmosphere allows it to detect the infrared region of the spectrum that includes iron's signature at about 1.6-1.7 microns. This range is normally absorbed by the Earth's atmosphere and unavailable to Earth-bound telescopes. The detection of iron so early in the Universe's history has profound implications. "The presence of iron, and, by implication, all other lighter elements, shows that basic ingredients for planets and life were present, at least in some places, very early in the history of the Universe. This is much earlier than the formation of the Earth itself 4.6 thousand million years ago," says team member Michael Corbin. These results also suggest that the first stars formed before the super-massive black holes that power the quasar engines in the centres of galaxies. Other observations have shown that the first quasar engines started slightly before 900 million years after Big Bang. The first stars would therefore appear to precede them by several hundred million years. The creation of the black holes themselves still remains a mystery, although the birth date of the first stars may prove to be a very valuable clue. This is the first major scientific result to emerge from the NICMOS instrument that was revived during the Hubble Servicing Mission 3B in 2002. Servicing Mission 3B was the last successful mission of the Space Shuttle Columbia that was lost on 1 February. The authors would like to respectfully dedicate this paper and the discoveries therein to the memory of the crew of the Space Shuttle Columbia. The team is composed of W. Freudling (ST-ECF/ESO, Germany), M. R. Corbin (CSC/STScI, United States), and K. T. Korista (Western Michigan University, United States). 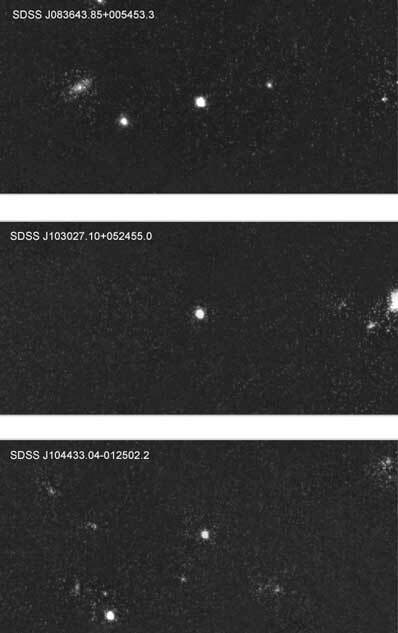 The team announced their discovery in the 20 April 2003 issue of Astrophysical Journal Letters.